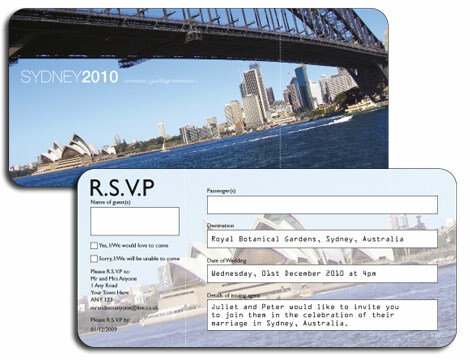 Australia Ticket Invitation was the starting point for Juliet and Peters gorgeous destination wedding invitations. After sending a selection of samples of both Boarding Passes and Passport Invitations Juliet and Peter decided they actually wanted both. The Passports would serve as invitations and include extra information for their guests. They would then use the Boarding Cards as RSVPs to compliment the travel theme. I initially gave Juliet and Peter three possible designs for their Boarding Pass to choose from and they opted for the one below. It worked perfectly with the Passport and the images would certainly get their guests in the mood for visiting the beautiful city of Sydney. Scroll down to the bottom of the page to see the other two options. "My fiancé and I had decided to get married in Sydney in December, and knew that we’d need something special to encourage people to fly all that way, especially over Christmas. I’d been searching for weeks to try and find something unique, that felt like it really represented what we were about, so when I finally found Kate’s website I was so excited. Using the passport style invitation, we were able to include all the information we needed about flights and accommodation for the wedding, but still make the invitations fun. Kate was really helpful throughout the whole process, and gave us a number of options to choose from before we settled on our final design. We couldn’t be happier with the end result!" Kate was really helpful throughout the whole process, and gave us a number of options to choose from before we settled on our final design. We couldn’t be happier with the end result and love our Australia Ticket Invitation!" Airline Tickets or Boarding Passes come supplied with a tear off section so it makes them a cost effective way of incorporating an Invitation and RSVP in one. I can customise any design with an image of your choice, either one you supply or I can source something suitable. This might be a photograph of your wedding destination or perhaps even a gorgeous picture of the two of you. If you're planning an engagement shoot perhaps you could plan to use one of the images in the design of your invitation. Contact me with your ideas for your Airline Ticket Invitation.